Scientists more than doubled the confirmed population of planets found outside our solar system by NASA’s Kepler space telescope, announcing 1284 newly verified exoplanets at a briefing Tuesday. This brings the number of verified exoplanets discovered with Kepler data to 2325 and the total number of exoplanets to more than 3200, according to NASA. Within the new haul from Kepler, about 550 of the bodies could be rocky planets like Earth. Nine orbit within their star’s habitable zone, a “Goldilocks” area neither too hot nor too cold for liquid water to persist on a planet’s surface. That brings the total number of potentially habitable planets to 21. Astronomers using the Kepler telescope detect planets by noting the small, temporary, and recurrent dip in stellar brightness that takes place each time a planet orbiting its home star passes between the star and Earth, a passage known as a transit (see NASA video below). 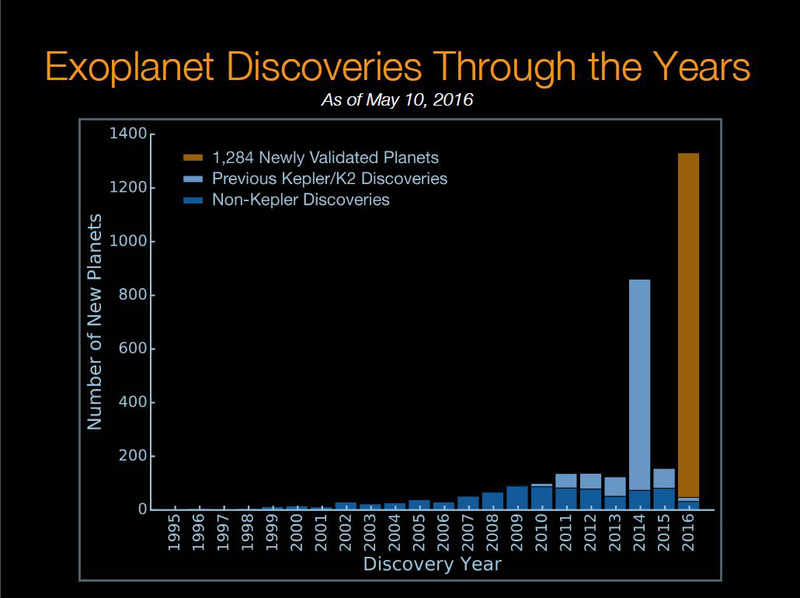 Working with Kepler’s catalog of planet candidates issued in July 2015, scientists involved with the new findings also pegged another 1327 candidates as likely planets that require additional study. What’s more, they labeled 707 candidates as likely imposters caused by such phenomena as a small star masquerading as a planet transiting its home star. An automated verification technique determines with 99% certainty that a signal derives from a planet transiting its star. Timothy Morton, lead author of a 10 May study published in the Astrophysical Journal, said at the briefing that he used an automated verification technique to determine with 99% certainty that a signal derives from a planet transiting its star. Just the day before the exoplanet announcement, a relatively local transit made news as the planet Mercury passed across the face of the Sun as seen from the perspective of Earth. Morton, a Princeton University associate research scholar of astrophysical sciences, said the previous process of verifying exoplanet candidates as true planets was time-consuming and resource intensive, involving scientists running calculations after scrutinizing each high-resolution image. Comparing planet candidates to bread crumbs, he said ground-based instruments can pick up a few large pieces of bread. “If you spill a whole bucketful of small crumbs, you are going to need a broom to clean it up,” he said. “Our broom is a new analysis technique that enables us to quantify the probability that any given signal is in fact caused by a planet, without requiring any follow-up observations.” He said the new technique takes a few minutes per candidate to do calculations. She said the wealth of exoplanets could change the way people see the universe. “When you look up in the sky, you’re not just going to see pinpoints of lights and see them as stars. You’re going to see pinpoints of light and see them as planetary systems,” she said. Kepler monitored 150,000 stars in a small patch of sky near constellations Lyra and Cygnus during its primary mission, which concluded in 2013. 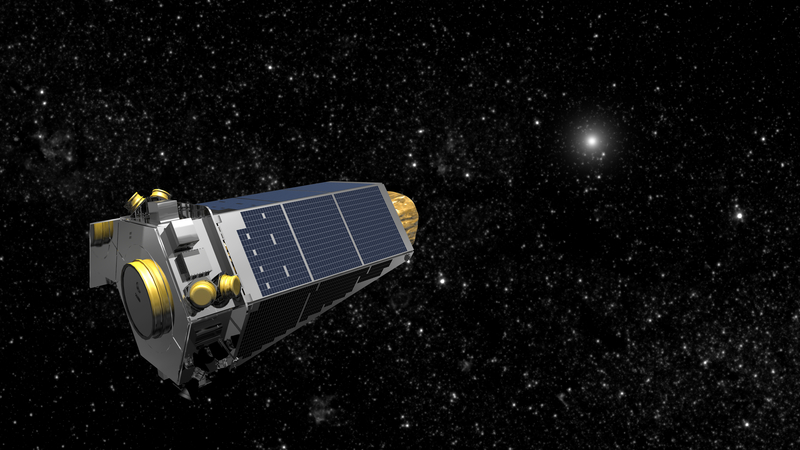 Now Kepler is conducting its follow-on mission, called K2. Despite a recent anomaly that put the spacecraft into temporary emergency mode, “right now everything is looking good,” said Charlie Sobeck, Kepler/K2 mission manager at Ames. Constrained by dwindling fuel, the mission will last until midsummer 2018, Sobeck said. Citation: Showstack, R. (2016), Largest haul of newly verified exoplanets announced, Eos, 97, doi:10.1029/2016EO052255. Published on 12 May 2016.